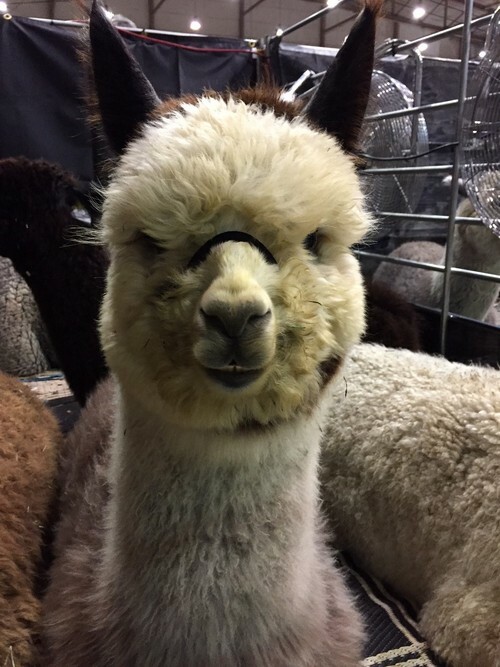 Velvet - 18 months in full fleece! So very fine! Steel also inherited his sire's trademark silky handle. As he matured, Steel's uniformity and retained fineness brought him to the very top of his extremely competitive classes in the ring. The judges consistently commented on his extreme fineness and soft handle and now his histogram numbers fully support this. Steel is a handsome male with an excellent breeding background and has matured into an elite macho, who has produced champion offspring of his own! Steel's dam, Crescent Moon's Starbright is a lovely Rayo Del Sol daughter who was a blue ribbon winner and a reserve champion in the ring herself. 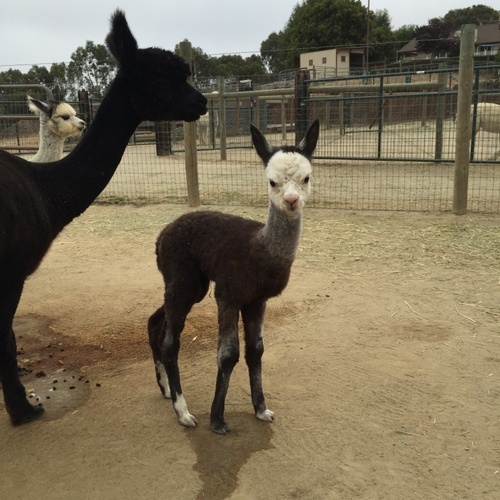 She was a gentle female and proved to be a topnotch breeder and mother. 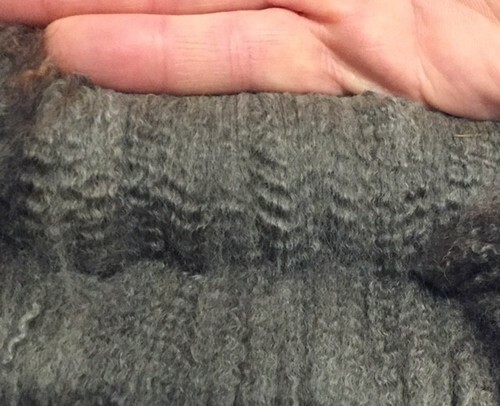 At 6 yrs of age, Starbright's fleece was still 21 microns. 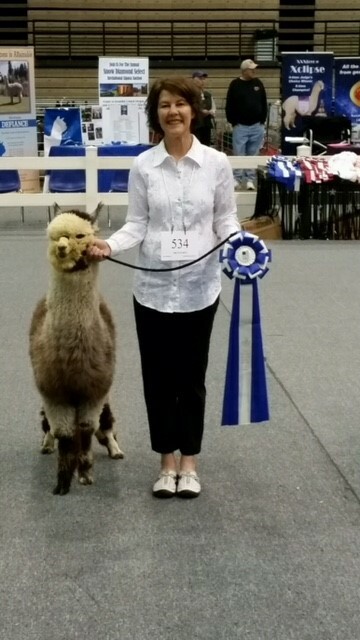 Just for fun, we brought Steel out again in 2013 for a local show- The International Alpaca Odyssey where he was 1st in both Cottage and Commercial grey classes, and Color Champion in the IAO Cottage Division. Although winning and ribbons are fun and good, but the true test of a great herdsire is in his offspring. Once more Steel continues to shine both in the brightness, fineness and soft silky handle of his offspring's fleece as well as the beautiful look he stamps on each offspring. June 15, 2018 - Bella Noche will be rebred to Granite Bay Royal Steel, 2017 Futurity and GWAS grey male Reserve Color Champion!. Her October '17 son by Royal is spectacular. Congratulations to Pat Kemberling of Deja Vu Alpacas for purchasing ROCKSTAR's Iron Man!! ROCKSTAR's Velvet Revolver was born on a foggy grey morning in August of 2016. I remember seeing her standing next to her dam, Bella Noche (Bisturi/Vantaggio line), and thinking I was pretty lucky to get another US Steel daughter. Standing strong and proud, this little female has been perfect in every way. She is adorable to look at - a real standout on the farm. As you'd expect US Steel handed down his very reliable fleece traits... so very fine, dense, with uniformity throughout her blanket. She has a silky soft handle to her fleece, again a hallmark trait given to her by dear old dad, that you have to feel to believe. She was rewarded for this, and her stellar confirmation at the 2017 Futurity show where she strutted her stuff in tough competition. She placed at all 2017 shows she attended - Futurity, AOA Nationals, and GWAS. Most important to us at this point in a foundation female; Velvet has her dam's sweet, sweet personality and is showing signs of having quite the mothering instinct. 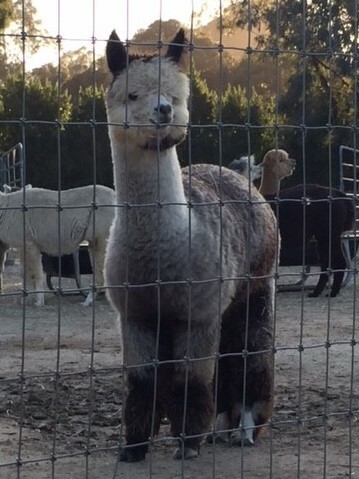 She loves to hang out with the new cria and we can't wait to breed her this coming summer. 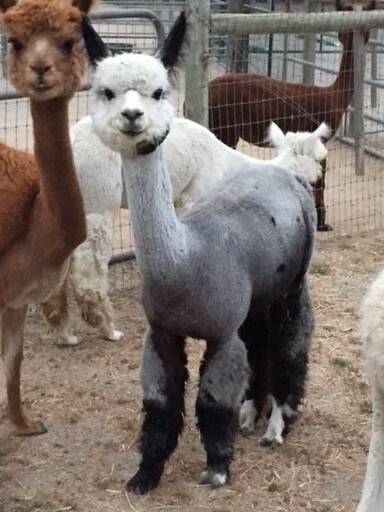 Her 1st date will be with Janus' Grey Fox of Granite Bay. This pairing promises to be one made in grey heaven!